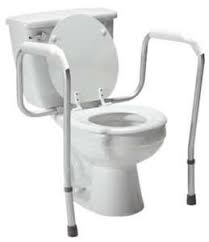 The Cardinal Toilet Seat Safety Frame from IndeMedical.com works over a standard toilet or with a raised toilet seat. Armrests provide secure hand and balance support. Easy to attach aluminum bracket. Arms fold back for cleaning and remove easily for transfers, adjusting from 17-1/2" to 20-1/2" wide. Q: Does the back bar of the Safety Frame hinder the Flush lever? The image does look like it comes close to the flush handle, but it does not interfere with flushing. 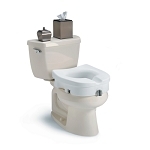 The unit is height adjustable and it sits about 3" away from the back of the toilet.